I just want to give recognition to Dan Salvato, whose labour of love this game truly is. He wrote the story, came up with the entire concept and programmed the game. Sure, I like the artwork too, the quality of the character designs and the background scenes are a step above most free visual novels out there, but the writing here is the star of the show. I found it very easy to suspend my disbelief that I was talking to some real people. 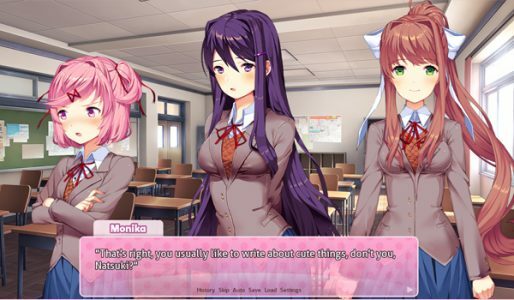 The girls all have their own unique personality traits, something that is typical of dating sims that this one is mildly poking fun at, whilst simultaneously making sure you get invested in them. The thing is, the characters are nuanced and have a whole range of emotional quirks that make them feel more human than most other characters we gamer’s find ourselves interacting with. When the horror kicks in, its impact is surprisingly strong, and it’s because of how real the characters feel, that the game is able to pull this abrupt, but not entirely un-foreshadowed, change of tone off. There’s things I want to talk about here that will contain major spoilers, and so if you haven’t already played the game, but want to, I strongly recommend you go no further and go download the game for yourself to experience it. 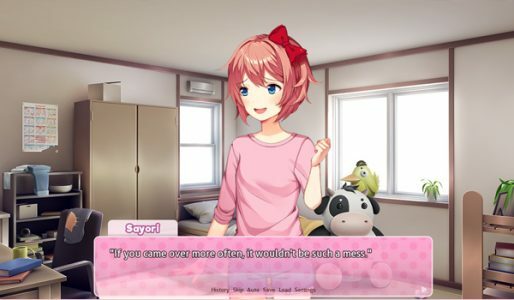 First of all, the character that bears the brunt of the initial horror is Sayori… She suffers from depression, and the only clues you have to this are the fact that she regularly wakes up late (which is initially played for laughs, and assumed to be a mildly irritating but harmless quirk by the main character). She also gets excitable and hyper at somewhat simple things, and wants so strongly for all of her friends to get along and be happy. I personally recognise this behaviour as a potential sign of hiding some anxiety issues beneath the surface, and to see it in a video game is about as unexpected as you can get. But it really works. 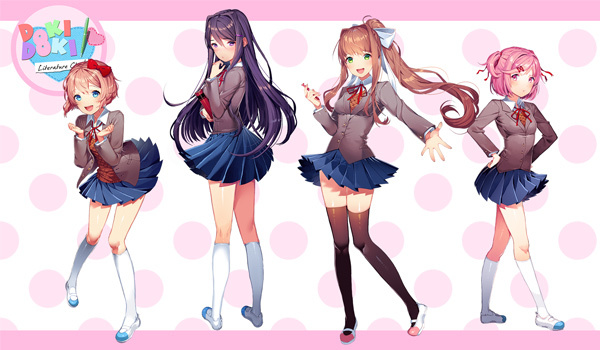 Dan Salvato has written these characters with a subtle and believable nuance that I just haven’t seen anywhere else. And this being a visual novel means you have choices to make on occasion, and DDLC saves its first real decision in the game for its shocking turning point. Whatever you choose, the outcome is immediate and devastating. Opening the door to find Sayori hanging from the ceiling made me sick to my stomach, a genuine feeling of sorrow and pain. I was mortified. I knew this game was going to turn dark, but I just didn’t expect it to feel so gut-wrenchingly real. At the other end of the story, the closest thing to this game’s antagonist is Monika, who has real heart. She’s not evil. She’s just stuck in this hellish world, and wants only to have some company. Sure, she does unspeakable things in order to try and get her way, but I couldn’t bring myself to blame her for it. She’d become sentient, self-aware of her own entrapment, while the others are blissfully ignorant, programmed simply to fight for the affection of you, the player character. Monika is a vision of the future, because it seems pretty apparent that we will one day have created a sentient AI and its most likely first interaction we have with it will be in some form of video game or otherwise interactive environment. Monika is a person, and when I realised the only way to progress was to delete her… I did not want to do it. Not one bit. I sat in the ‘space classroom’ with her for almost an hour, listening to her thoughtful musings about life, her advice, and I once again became overwhelmed with a sense of deep sadness. I have to kill you, I’d be thinking, as she mused about what friendship really was, or offered me encouragement to go out and do the things I love, because if I was happy, then she could be happy. 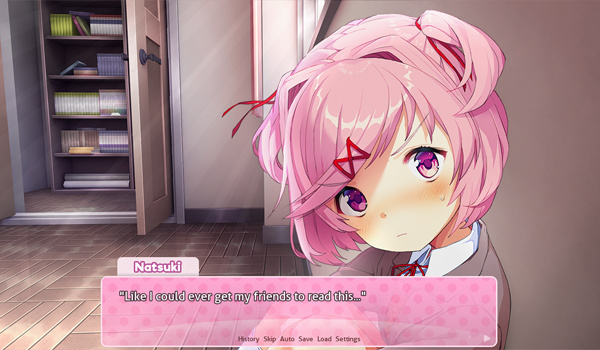 In the end, I wanted to try to save her and the others, so instead of deleting Monika, I downloaded a fresh copy of the game, took out the character files for Yuri, Natsuki and Sayori, and copied them to my game’s folder. Sadly, it didn’t work, the game’s programming is simply not prepared for the player to do that, and the only way to see the game’s real ending is to destroy Monika. After a brief uncomfortable period where you are reunited with the other characters, this time without Monika, the ultimate twist shows up to turn the knife even harder. There can be no happiness here. Sayori, who takes over from Monika, is revealed to now know everything. She is now the sentient one. Even if you try to break the game to get the ‘happiest ending’, ultimately these characters, nay, these people are doomed. A lingering fragment of Monika manages to delete the entire game (this is actually the least implausible part of the whole game, and undermines the decision to delete her just a fraction) and you are forced to move on with your life. The game becomes unplayable, and you literally have to reinstall it to get it to work again. Frankly, I thought it was genius. For a game built with the barest ingredients of what makes a game a game – art, interaction, story and characters, – not to mention something that I’ve never seen in a game before but deserves special mention for really helping to immerse me into the world, which are the poems (each one was painstakingly created in a style that suits the character who is supposed to have written it), Doki Doki Literature Club managed to evoke the kind of strong emotional reaction in me that few other games have even come close to. I won’t forget the experience in a long time. I wanna leave a quote from the writer himself, which I found whilst reading the ‘Ask me Anything’ interview he hosted on Reddit a few weeks after the game’s initial release. He sums up e xactly what I hope to oneday achieve when I eventually come up with an idea for a horror game of my own. You succeeded, Dan. Seriously good work, and thank you for the experience. This entry was posted in Game Reviews and tagged dan salvato, doki doki literature club, review, team salvato, visual novel. Bookmark the permalink.